Although he no longer plays for the school, David Rivera is a basketball enthusiast, with a passion and love for the game. Whether it be playing intramural basketball or watching the NBA (National Basketball Association), he’s still invested in the sport. When Rivera first began playing basketball at the age of 6, the sport didn’t hold much significance to him. But now, 10 years later, it’s an integral part of his life. He said, “I like essentially anything relating to basketball. That’s kind of my thing even though I don’t play for the school. I’m intrigued by basketball and I love playing it in my spare time”. After playing for the high school his freshmen year, Rivera did not try out his sophomore year, nor did he try out this year. He often contemplates the possibilities if he didn’t quit, but is grateful he can prioritize other things now (school, jobs, etc). “I do somewhat regret quitting, but somewhat not. Because I always think about what could’ve happened if I didn’t quit because I really do enjoy the sport. 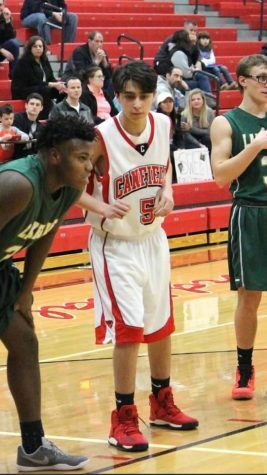 I did enjoy my time playing basketball for Canfield, but I feel like I’m happy I quit because I can put my time towards other things now,” said Rivera. Along with playing basketball, he watches the NBA whenever he gets the opportunity. Rivera, however, is a Chicago Bulls fan, even though he was born in Northeast Ohio. “I was a young boy and my Aunt moved to Chicago and she came home (came to visit) and she got me a Chicago Bulls shirt. At that point in time I didn’t have a favorite team so I decided on the Bulls”. Derrick Rose (a NBA player), who was previously on the Bulls, has the support of millions of fans, one of which is Rivera himself. Rivera has followed Rose throughout his entire career and still does to this day.